After launching the Leap, BlackBerry's handset supremo, Ron Louks, has confirmed that the Canadian phone maker will release three more devices in 2015. Oh, and he pulled one stunner of a prototype from his pocket as well. He described the device as being one with "a dual curve, all touch display with a keyboard" – a smartphone that looks a lot like the Dell Venue Pro and the Palm Pre, albeit longer. But it is the Galaxy S6 Edge that appears to be its inspiration and we wonder whether Samsung, which has strengthened its relationship with BlackBerry recently, didn't throw in a couple of hardware bonuses as well. John Chen, BlackBerry's CEO, referred to the phone as "the slide" and confirmed that it would be released later this year before saying that it was "mechanically very innovative". Other than that new BlackBerry "Curve", two other products will be launched, one of them being a high-end (read expensive) handset produced in partnership with car manufacturer Porsche. 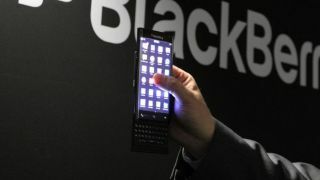 Expensive smartphones, it seems, are good business as Chen also revealed that one BlackBerry smartphone sold out in less than 30 minutes at retailer Selfridges.